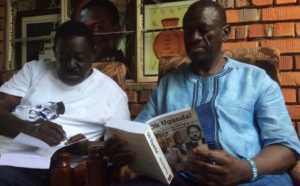 Dr Kizza Besigye (left) reads Omara Atubo’s book. Photo by Raymond Mayanja. 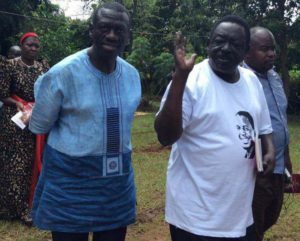 LIRA–Former Forum for Democratic Change (FDC) Presidential candidate, Dr Kizza Besigye, has gone to Lira district to fight the Presidential age limit project. Dr Besigye who was ealier blocked by the Police from meeting his supporters in the city centre was accompanied by Partick Amuriat, a party presidential candidate; Harold Kaija, the deputy FDC secretary general and Salaam Musumba, the party vice president for the Eastern region. Since Tuesday, police have been arresting Besigye and blocking him from leaving his residential home in Kasangati. Today, on his way to Lira district, Besigye visited the former Lands minister and UPC stalwart Daniel Omara Atubo at his home in Ngetta. 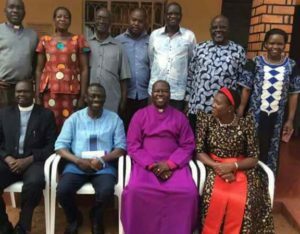 Dr Besigye (2nd left) with some religious leaders and elders in Lira district. Photo by Raymond Mayanja. “They have talked a lot about politics and how to mobilise grassroots support to the ‘Museveni dynasty,’” Walid Mulindwa, the FDC youth chairperson, said. During the meeting, Atubo expressed his views against age limit, saying that Uganda is like a vehicle moving without brakes. “It will definitely crash,” Atubo was quoted telling Besigye. Dr Kizza Besigye (left) chats with former Lands minister Omara Atubo. Photo by Raymond Mayaja. Besigye and his group also met the religious leaders in the district. Many opinion leaders are against the lifting of the age limit. They say amending Article 102(b) of the Constitution will allow President Museveni rule until death. The age limit issue has divided Parliament and led to the suspension of 25 MPs who were accused of misbehaving. They refused to vacate, prompting security agent to forcefully evict them. Some were injured during the eviction exercise and are now nursing injuries. 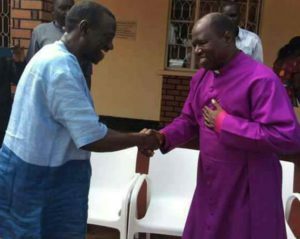 Dr Kizza Besigye is received in Lira by one of the religious leaders.